This time around, celebrate Eid with style. Bake beautiful themed cakes and cupcakes to celebrate the day and share happiness with your loved ones. Eid is a religious festival which Muslims all around the world celebrate thrice each year with full zest and enthusiasm to mark certain events. With the month of Ramadan almost here, Muslims would have started preparing for Eid-ul-Fitr which will mark the end of Ramadan. Eid-ul Azha will be celebrated approximately 67-69 days after to mark the end of pilgrimage. Like all other celebrations around the world, these days are also celebrated to show happiness and content among the Muslim community. Sweet dishes and desserts have become a tradition among the Muslim community to celebrate their occasions with. This page is dedicated to all the Muslim community out there. 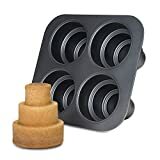 I have come up with different and unique cake and cupcake ideas and supplies which will definitely be quiet fun to try and will make the preparations easier. We present you a wide range of religious gifts which will be the perfect gift for your young lads. This is your one stop shop for purchasing an Islamic gift for your kid. Here are some of the cake ideas inspired by the Muslim culture. A mosque constructed by cake will be an awesome sight on Eid. What better way to celebrate a religious festival than a cake depicting the Prayer place? There a lot of ways you can create a mosque cake. For unique and creative ideas you can also get help from some amazing helpbooks offering many ideas which you can use. You can make a 3D mosque using different cakes. For the base use a rectangular sheet cake and on top of it place an inverted semi-circle cake to depict the dome of the mosque. Cut narrow rectangular pieces of cake and place them vertically on the corners of the rectangular base to show the minarets. Cover in icing or fondant as you desire. For this you will need a template from which to cut out the shape. Find a picture of the mosque which you want to make into a cake. Print it out and make Xerox copy of it increasing it 3 to 4 times in size. Take a sheet cake and place the template on top. Carefully cut out the boundary of the cake and cover carefully with buttercream making sure to cover the sides smoothly so that the crumbs don’t fall off. After that use different icing colors or fondant cutouts to finish the cake. You can also create a cake showing the Holy Book-The Quran. You do not have to write any verses on it as it will be considered unrespectable to cut the verses but you can write an Eid message on the cake like 'Happy Eid', 'Eid Mubarik' or 'Eid Greetings'. Just carve a cake in the shape of a book and decorate it. Calligraphy is also very traditional in Arab culture so the Eid message done in calligraphy will also look beautiful. Eid-Ul-Azha is celebrated by giving a sacrifice of a Lamb, sheep, cow or camel and distributed it's meat among the celebrators. A cake on Eid-Ul-Azha can be done very creatively and beautifully. You can shape the cake in shape of the animal you have sacrificed. Make a template of the animal as described above and decorate as needed. Mould out some animal toppers from fondant and top your cake with these toppers. You can also buy some animal decorations to decorate your cake. For a simple cake write an Eid greeting on the cake or use one of the many toppers available in markets. Make some batches of cupcakes if you don't want to have a single cake. 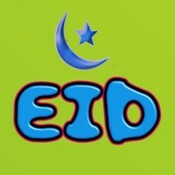 Decorate them with moon and stars for Eid-ulFitr and different animal shapes and Eid messages for Eid-ul-Azha. 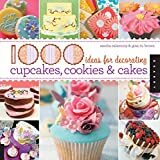 You can use many different colour combinations and decorations for decorating your cupcakes. Mould out little animals from fondant and use those to top your cupcakes with. Make the letters of EID MUBARAK moulded from fondant and using a letter each on cupcakes complete the message. Set your cupcakes in a tray so everyone can read out the message. Make crescent moon and stars. Mould them out or cut out the shapes. You can also use some star and moon toppers for the purpose. 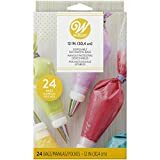 Some amazing products offered by Wilton have made cake and cupcake decorating very easy. Make sure you get your own decorating sets for easy baking!